This Thursday & Friday, April 29th and 30th from 9 AM to 9 PM, and Saturday, May 1 from 9 AM to 5 PM, Treadle Yard Goods is making their first appearance in the annual Twin Cities Quilt Shop Tour. We’re joining 9 other shops to say the Twin Cities Really Cooks! Each store will hand out a free 9” quilt block pattern, along with favorite recipe handouts! In addition, each shop has designed a creative layout for the quilt blocks using fabric that represents their shop. Because we are primarily a fashion fabric store, the lovely Anne used silk shantung to create our display quilt, and it is a thing of beauty! Layout patterns and optional fabric kits will be available for purchase. There are also 10 Second Prizes - each shop will contribute a unique gift basket at a $200.00 value! Visit all 10 shops to qualify for these great prizes! The participating shops are Bear Patch Quilting Co, Blue Bamboo, Calla Lily Quilt Shop, Fabric Town, Glad Creations Quilt Block, Quilt Cove, Rosebud’s Cottage, The Sampler, Silver Lane Quilting and Treadle Yard Goods. We have some beautiful quilts on display for the occasion. We have two that came to us courtesy of Michael Miller, one by our talented customer Marilyn Ampe, who dyed the fabric herself, and the masterpiece that Anne and Melissa collaborated on, made with our wonderful selection of silk shantung. Treadle Yard Goods has recently begun to carry the line of fabulous children's clothing patterns from modkid. Stop by soon to see the trunk show currently on display! Most patterns also have a matching doll-sized patterns for "just like me" fun! We have most of the patterns in stock, along with many of the fabrics and coordinating ribbons. Here is a sample of the beautiful pieces on display. This fantastic, inspiring photo was sent to me by one of our fabulously talented Treadlettes - Rebecca. 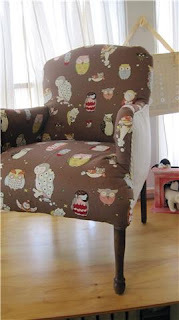 This owl fabric is one of our favorites, and Rebecca has used it to fine effect here. You may also feel free to email me at bandjontheriver (at) msn (dot) com if you would like your work featured here on our Treadle Blog! In the last Book Review Corner post I asked for suggestions for this Book Review Corner, and there was a request to review One-Yard Wonders. Well, I am happy to oblige. This is one of the more fun books out there. The projects range from garments to toys, household necessities to just amazing ideas. Rebecca Yaker and Patricia Hoskins (of Crafty Planet fame) asked only that the designs require only one yard of fabric. This book also has a special place in the hearts of the Treadlettes, as two of the patterns come from our own. The lovely and talented Nina Robinson designed a set of baby gifts, you can get a pair of booties, a bib, a blanket and a bag to hold them all from one yard of fabric! And I (Jess Bandelin) designed a rocket ship toy. One more fun feature of this book is that each of the designers has a bio in the back, and if you are a blog junkie, like me, you'll find that most of them have a blog to peruse. Fun. Thanks for the suggestion Cecile! Keep those photos coming, we love to see your projects! 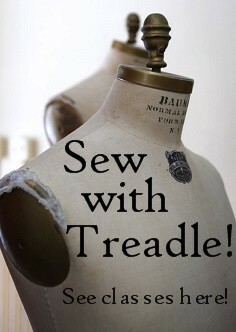 Well, as you might know, we're having a sale right now at Treadle Yard Goods. We opened our doors in April of 1976, that make it our 34th birthday! Please come by and join us in the celebration. 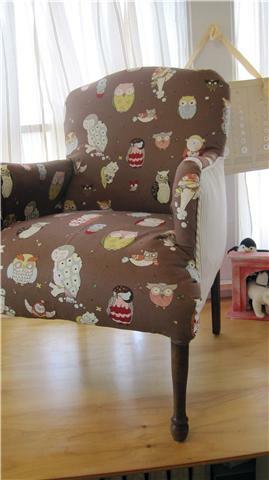 Everything in the store is at least 10% off, with some fabrics 20-50% off. We also have some news in the pattern arena. We have just added Colette Patterns and their line of 40's and 50's inspired garments are sure to be a big hit. I have already found a couple that I would love to make myself! Thirdly, and most exciting, we will have a visit from Anna Maria Horner in May. 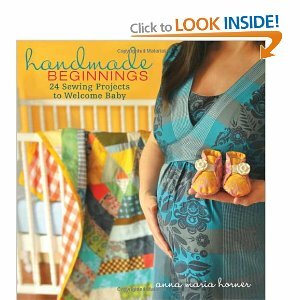 There will be more information coming soon, but we can expect Ms. Horner to visit on the 22nd of May to talk a little and sign her newest book Handmade Beginnings. Anna Maria Horner has some beautiful fabrics out right now and one of the Material Girls worked up this delightful top with Little Folks Forest Hills in the Berry colorway. Right now, however, it's too nice a day to keep blogging, so stay tuned for more exciting news on all fronts.